Here are some highlights from the talk and why Tamara encourages us to focus on our intentions rather than goals. I’ve also shared how I’ve started to use intentions more. As a intro, here’s what Tamara’s has to say about intentions in her book Mindfulness in Motion (Watkins, 2015). “Setting intentions is very different from setting goals. Consider the difference in the words intention and goal. First, drop the word goal into your mind and observe any words, thoughts or bodily sensations that arise in response. Repeat the word a few times. Now do the same with the word intention. The experience of doing this exercise really surprised me, so much so that I now try to work exclusively with intentions in every realm of my life. Goals have a rigid, external feel. They are ‘out there’ and we either achieve them or don’t achieve them. If we apparently appear fail to reach our goals, we tend to discard the successes we make en route. there could only be one outcome. On the flip-side, the word intention felt..
you had a bit more control over what you were trying to achieve. In many cases, it’s hard not to set goals but focussing on intentions can help us to be easier on ourselves when things don’t go to plan. I wrote about this in my recent blog post on Why failure can be a good thing. I was inspired by what Tamara mentioned about noticing the “stages of the journey” (or tasks or steps in my projects when it comes to my working world). Tamara reminded us that setting intentions can help us to deal with failure in a more positive way. We will be less harsh on ourselves as we will be more likely to acknowledge our successes (however small) along the way. Intentions can also help us to be more productive as we are able to move on from any setbacks more easily. At the talk, we also asked the crowd to think about their own nurture wish or intention for February. I wanted to encourage people to come up with a manageable wish rather than asking for a commitment for the rest of the year. Tamara reminded us that it as cool if we didn’t get to fulfil our nurture wish, whether it was having a massage or eating healthily. What is important is our intention to move closer to or even thinking about looking after ourselves better. I liked this approach as we felt less pressured to tick something off. I think the focus on intentions also helped the Lucky Things casual homework feel a bit more enjoyable! The months are flying by and so I’ve decided to set myself a few intentions each week and month. They give me direction and keep me focused on what I need to do when juggling work and family life. As I’ve been thinking about my plans this year, intentions have come in handy. I’m hoping to hold Lucky Things Meet Ups in other locations around the UK. 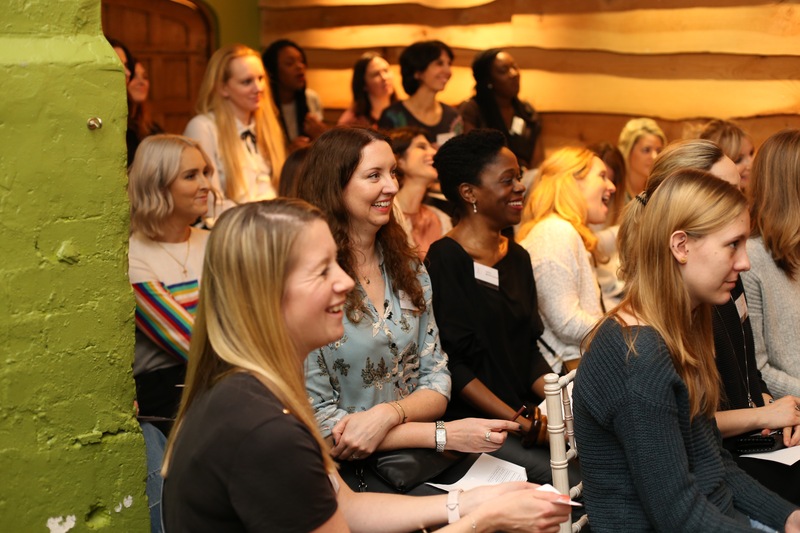 It’s an exciting way to broaden my project to encourage more women to network, build supportive connections in real life and invest time in themselves. I guess there are three intentions right there. I don’t see these things as three set goals as I feel it’s more of a flexible vision. I know I may need to tweak my plans as things progress. Thinking about intentions takes the pressure off if I can’t find the right date (at first), or things have to flex a bit when working with different locations and venues. Over to you…What do you think about setting goals? How does the word goal make you feel? Do you prefer to set intentions instead? Do you prefer to set number-focused targets or more qualitative targets? How do you feel about not meeting goals? If you get a chance, check out A new way of thinking by Claire from The Pramshed. Claire was at the Lucky Things Meet Up in January and shared a really nice perspective on her blog. The Lucky Things Meet Ups are friendly and inclusive networking events for women. Please get in touch at sunita@luckythings.co.uk if you’d like to hear more about new dates.